Fischer Projections and the "Exchange Method"
How to Draw Fisher Projection? Fisher projection is the two dimentioanl representation o a three dimentional molecule. The conversion of a perspective drawing to a Fischer projection requires rotating the molecule so that the "top" and "bottom" groups are oriented back, away from you. This places the "right" and "left" groups in a position where they are projecting outward towards you, as in a "bow-tie". 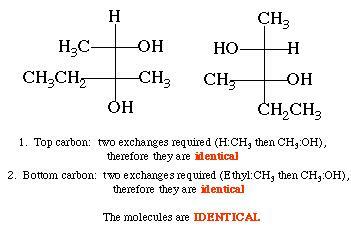 With the molecule thus arranged, all bonds are drawn as simple lines, and the central carbon is always omitted. A Fischer projection can be rotated and manipulated, and most usefully, can be utilized to assign absolute configuration (R or S) and to compare sets of compounds in order to determine their stereochemical relationship (enantiomers, diastereomers, identical, or meso). The single most important rule regarding rotating a Fischer is that 90 degree rotations are disallowed; rotating 90 degrees generates the enantiomer of the molecule you started with. A 180 degree rotation regenerates the identical configuration, 270 an enantiomer, etc. In order to use a Fischer projection to determine R or S stereochemistry, you need to realize that the "bow-tie" orientation of a Fischer can be gently tilted backward to yield a structure where the top atom is oriented backward, and the remaining groups are coming forward. Assigning priorities and determining R or S can then be done in the conventional manner. You should note, however, that in the drawing below, connecting the priorities in the original Fischer projection gives the same rotation as in the drawing on the right (both are S). This method will always work if the lowest priority group is oriented either up or down on your Fischer projection. 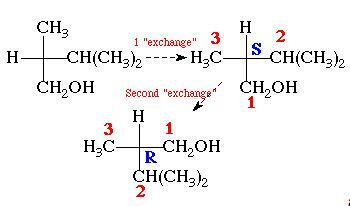 •  Exchanging groups twice ("two exchanges") regenerates the original stereochemistry. The "exchange method" can also be utilized to compare stereochemistry among Fischer projections by simply keeping track of the number of exchanges which are necessary to convert each chiral center into a reference structure. Thus for the molecules shown below, converting the top carbon of the structure on the left into the same orientation as the one on the right requires two exchanges; the centers must therefore be identical in configuration. The bottom carbon also requires two exchanges, and is therefore identical in configuration with the structure shown on the right. Since both centers are identical, the two molecules must be identical. 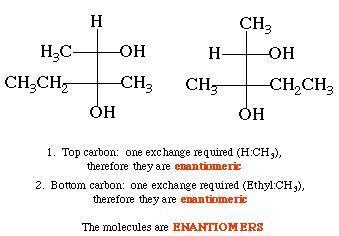 The two molecules shown below are enantiomeric at both centers, and are therefore enantiomers. 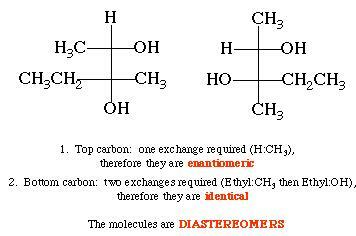 The two molecules shown below are enantiomeric at one center, and identical at the other, and are therefore diastereomers. Click here to refer the Revision notes on Organic Chemistry, IIT JEE Organic Chemistry Syllabus and Chemistry books.